Should My Child Have A Psycho-Educational Assessment? Committing to a psycho-educational assessment is a difficult decision to make. If you are concerned about your child’s academic or social performance, there are a few steps to take. Take a look at our flowchart to help you make the right decisions. Making the decision may be the hardest part of the process. If you are experiencing changes in your child, keep a close eye on him or her. Changes can be caused by any number of factors; an isolated incident may just need monitoring. If the change in behavior or academic performance is consistent, considering an assessment is beneficial. Monitor your child’s interest and change in academic abilities via feedback from their teachers. Are they misbehaving in class? How is their performance? Are they simply losing interest? There are many things parents and educators can try before opting for an evaluation. Disruptive? Avoiding work? Distracted? A change in classroom behavior may be indicative of learning or attentional difficulties; from a lack of understanding, unable to appropriately navigate certain social environments or perhaps even boredom. A psycho-educational assessment can help to uncover the underlying issue. 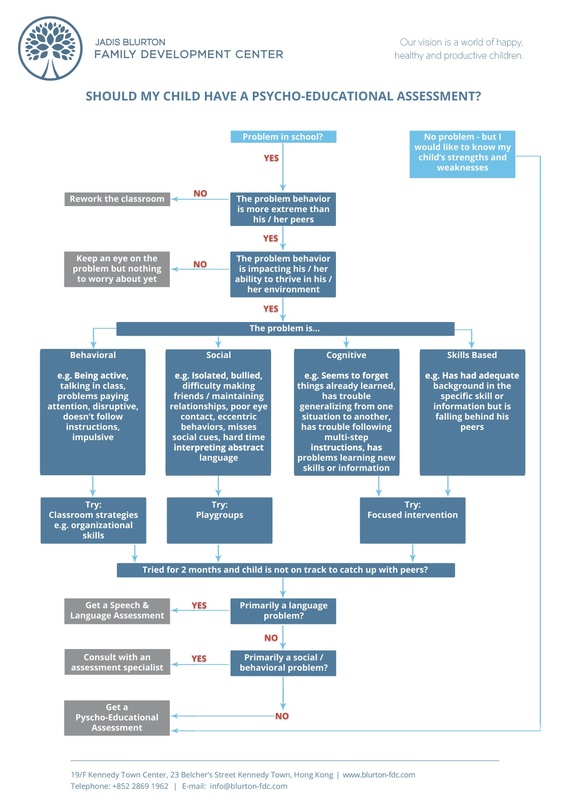 To help with your decision, refer to our Psycho-Educational Assessment Decision Flow Chart to ensure you’re on the right track. Ask yourself the right questions. Our rigorous testing will assess a wide range of elements such as the child’s academic achievement, cognitive abilities, social and emotional functioning, ability to sustain attention and look in-depth at family history. From this, we are able to create an extensive report to include a full diagnosis and recommendations on how best to support the child. With consistent check-ins following the assessment, we can further assist the process of moving forward with suggested intervention strategies and learning plans. By refining our assessment protocol, we are in a position to best support children, parents and educators alike. Parents can often feel overwhelmed when handed such an intensive report. There is a lot of information to take in and many further steps to take. We lay out the stepping stones for our clients and walk with them every step of the way. Our customized treatment and learning plans for each client provide an easily accessible gateway for both children and parents to feel comforted, supported and guided.